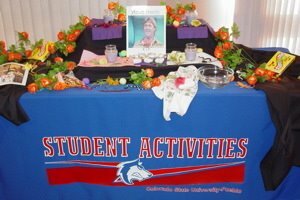 I like this on so many levels, but mainly for the cheerful appropriation of the oh-so-seriously multicultural Day of the Dead event in the university's student center. I bet that Steve Irwin would have gotten a laugh out of it too. And all at the Colorado taxpayers' expense, since this is a state university.